The Relativistic Heavy Ion Group (HIG) searches for and investigates the property of new states of matter in extreme conditions, a hundred thousand times hotter and a trillion times denser than the core of the Sun. Such extreme conditions can be created for a moment following high-energy heavy-ion collisions in two laboratories: Brookhaven National Laboratory (BNL), Long Island, New York and CERN, Geneva, Switzerland. Quantum chromodynamics (QCD), the theory of the strong interaction, makes an intriguing prediction about a state of matter in extreme conditions: if matter is extraordinarily heated or condensed, it will enter a new thermodynamic phase, quark-gluon plasma (QGP), in which quarks and gluons are deconfined from hadrons. QGP is the primary interest of this group. This group led the PHOBOS experiment at BNL, which concluded data collection in 2005. The PHOBOS experiment is one of the four experiments that observed surprising properties of a new state of matter created by BNL's Relativistic Heavy Ion Collider (RHIC). This new state of matter was produced at temperatures of about 4 trillion degrees Celsius after gold-gold collisions and lasted for less than a billionth of a trillionth of a second. While it was expected that quarks and gluons behave like molecules in a gas in an extremely hot and dense environment, the observed properties indicate that the properties of this new matter are close to those of a perfect liquid. This group now takes a leading role in the heavy-ion program of the Compact Muon Solenoidal (CMS) experiment at the Large Hadron Collider (LHC) at CERN. 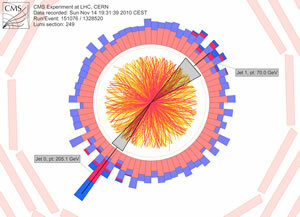 The LHC is capable of colliding lead ions at the energy about 30 times higher than RHIC. The CMS experiment will examine this perfect liquid of quarks and gluons at much higher temperatures and explore different parts of the phase diagram. The CMS experiment collected lead-lead collision data in November 2010. The CMS collaboration is presenting over 25 new results at the 39th International Conference on High Energy Physics (ICHEP 2018) taking place in Seoul, South Korea from July 4th-July 11th, 2018.